Coil + Drift founder John Sorensen-Jolink fuses dance, design, and performance in a new video installation to be presented during NYCxDesign. For me, ballet has long been synonymous with a meat hook. One of the ballet mistresses in the school I trained at referenced it constantly, encouraging us to imagine our sternums lifted by the metal device, prompting our limbs to follow suit with energy spiraling through each appendage as we stood completely still at the barre. The same kind of poised vitality characterizes how John Sorensen-Jolink, the stately 33-year-old designer behind New York–based furniture company Coil + Drift, carries himself. Before founding the studio, four years ago, the Portland, Oregon, native spent a decade touring the world as a modern dancer, performing pieces by directors and choreographers including Philip Glass, Robert Wilson, Lucinda Childs, and Twyla Tharp. Next week, he comes full circle with a project that fuses dance with furniture design in “_Home Unimprov,” the first in a series of events organized by Frederique Thiollet of curatorial agency Hotel Particulier. On view from May 16 to 21, in a sprawling storefront at 7 Wooster Street in New York City, the immersive installation will feature a live performance on opening night, plus three custom iterations of Coil + Drift’s arc-back Soren chair (to be sold through Hotel Particulier) and a three-channel video titled “Unconscious Forms,” which he directed, choreographed, and created the furniture and lighting for. (Watch an exclusive first look at the video, above.) Together, the pieces explore the intimate, and sometimes unusual, ways people interact with objects in the privacy of their homes. Sorensen-Jolink would know. He got into design while dancing professionally; constantly away from home, he increasingly cherished whatever objects he had with him at any given time. He also craved a less ethereal creative process as well as financial security. Curious about his object fetish, Sorensen-Jolink took a woodworking class at Brooklyn’s Makeville Studio and fell in love; a year and a half later, he was making and selling furniture full-time. His pieces—pure, balanced, effortlessly beautiful—are made using choreographic concepts he learned as a dancer, such as negative space, spatial awareness, and the use of character to inform an item’s look and feel. Upon deciding to implement these ideas in a more intentional way, Sorensen-Jolink was suddenly freed of any inhibitions: he had been training to be a designer, intuitively, his entire dancing career. People have attempted, at times successfully, to describe exactly how dance informs Sorensen-Jolink’s design process. The arced backrest of the Soren chair, for example, is a perfect half-circle that suggests the arms of a pirouetting ballerina; the cast-resin rings of the Cirrus chandelier create a lively, carefully composed interplay of winding light. That’s all true, but there’s more to it. “On a creative level, it’s an understanding of space that comes from inside you, because for dancers our tool is our bodies,” Sorensen-Jolink says, referencing a dancer’s daily task of refining movement within themselves. “That kind of visceral feeling is what I’m doing with design: taking this understanding of the way we move and creating objects that somehow feel like they’re activated. And I say ‘activated’ because they don’t feel like they are actually moving—they feel like they’re alive in the way of a three-dimensional being.” In other words, the meathook effect. To better understand the ideas behind Coil + Drift, and how this month’s presentation marks a major turning point for the company, Surface sat down with Sorensen-Jolink to dive deeper into his creative process. Our conversation illustrated Sorensen-Jolink’s aim to make live performance a permanent part of Coil + Drift’s identity, and revealed an enduring artist who’s far from taking his final bow. 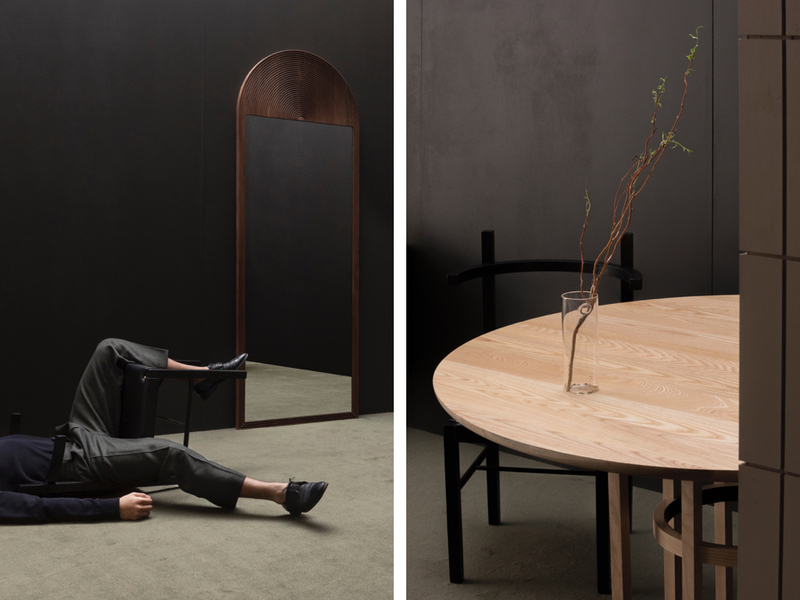 How did the idea to fuse performance with your furniture pieces come about? Last December, I was invited to do a 45-minute lecture at [Brooklyn creative space] A/D/O. It was the first time I’d spoken publicly about my work, and I didn’t think I could talk for that long, so I decided to move as well. I went into the studio and started to create a vocabulary—while simultaneously designing a collection with movement that would become [my] Unconscious Forms furniture collection—and ended up with three different movement categories. During the lecture, I’d just stop and dance. Afterward, it was clear that I was going to take this new vocabulary and work with performers, and that’d become the presentation I’d launch the collection with. At the same time, I knew I wanted to create something that was more than a live presentation. I was thinking film, since it can live longer online and can be seen by a larger audience. I contacted [Brooklyn director] Charlie Schuck, told him I’d wanted to work with him forever, and he agreed to make a video. He was one hundred percent on board from the beginning, which was a dream come true. People from outside the dance community have pointed to concepts like negative space and spatial awareness as ways that dance informs your furniture. But is there something deeper driving your connection between dance and design? That is the question, isn’t it? I started doing it without knowing it, so I’ve been questioning what’s actually happening, too. On a creative level, it’s an understanding of space that comes from inside you, because for dancers our tool is our body. The process of being a dancer means that every day, you’re going into a space and refining movement inside of you. That feeling, that daily routine, never leaves you and it affects everything you do forever. That kind of visceral feeling is what I’m doing with design. I’m taking this unconscious understanding of the way we move and creating objects that somehow feel like they are activated. And I say activated because they don’t feel like they are actually moving—they feel like they are alive in the way of a three-dimensional being. Like when a dancer stands in a position: She’s totally still, but totally alive. That’s exactly it. The corrections and adjustments you’ll get in a daily class have to do with blockage and flow in a still position. When I was giving that lecture, I talked about designing the Soren chair to feel like it is supported by the lower abdominals, as opposed to a chair that feels slouchy, maybe dead. What I’m really saying is that the chair is very held, very up and alive, which is very balletic. It’s a very ballet-feeling chair. The other thing I see coming out of my work is a feeling of balance. I like objects that are symmetrical or have asymmetry that feels balanced. It needs to feel like there’s opposition. And that has to do with that energy that’s flowing through the piece. I’m also a Libra, so I have a lot of balance issues I think about. There are many historic collaborations between choreographers and designers making set pieces—Isamu Noguchi and Martha Graham, Robert Rauschenberg and Merce Cunningham—but there aren’t a lot of dancers who come into the design world and try to incorporate movement outside of a theatrical setting. How have people reacted to what you’re doing? In that A/D/O lecture, I felt like it took the whole talk and the question-and-answer session for people to really understand what was happening. The reaction was really positive, but the people who understood it best were dancers. So it’s very clear to me that I’m coming from a world that has its own vocabulary and feels kind of exclusive. How do I verbalize that to the rest of the world? The simplest way to put it is that I see objects, and the creation of objects, from the perspective of a dancer. And the connection between the two worlds is that they’re both objects in space. One of them is alive and moves; the other is static. I’m questioning if a static object can also be alive. Bringing in a live performance to the presentation of these objects helps activate them, especially to people who haven’t necessarily seen furniture or objects in general in that way. How will the dancers activate the Soren chairs in next week’s presentation? I imagine someone [seeing one of the chairs in the “_Home Improv” installation and] saying, “Oh, it’s just a chair with giant tusks falling forward because its back arc is so big.” But then they’ll see a dancer push it up onto its four legs and sit down on it, and then they’ll see it as a chair. And maybe for a second they’ll see it as a chair that is alive, and has a purpose and identity—but it needs us to activate it. That’s the whole idea of “Unconscious Forms:” that humans are involved and required in this process of activating. These objects would be just pieces of material if not for us. Not that they wouldn’t be creative, but if we just left, their identity would cease to exist. It’s a chair because we use it, not because of the form. Did you ever formally retire from dancing? No. And I don’t want to because I think it’s interesting to keep letting dance inform the design process. And also because I’ll now permanently be bringing dance into Coil + Drift—that’s going to be what you think about when you think of the brand. 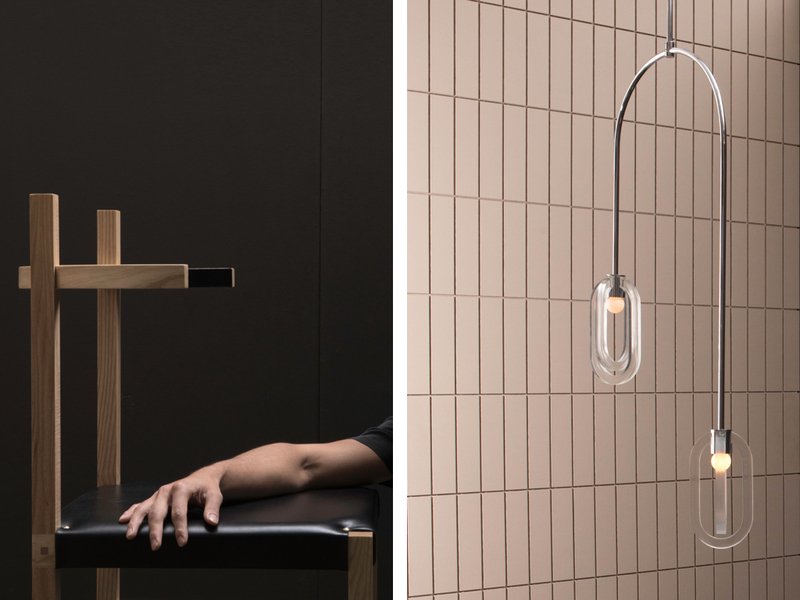 Beyond merging the worlds of dance and design, what message does furniture from Coil + Drift send out into the world? My goal is to show people, through the lens of design, that these objects have life. People say that if you live with pieces you love, it kind of changes your life. I agree with that and think that the reason these objects change you is because they have an energy. We talked about that flow of energy through a dancer’s body—if you can see objects in that way, maybe you can have a bit more awareness in your everyday life. I mean, my husband works for an NGO in the medical world that is literally saving lives. I know I’m not doing that. But I do think that design matters and that it affects the way we live. And beauty matters. I’d like to bring more of that into the world, too.